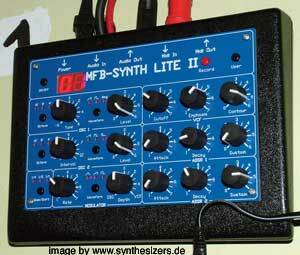 MFB Synth Lite + Lite2! Fricke MFB Synth – MFB 502 drumcomputer MFB sequencer/filterbox (new)..
MFB Synth overview / überblick..
he mfb videojaying boxes for 8 sequences , midi controllable.. the other one is to control colour, contrast and more..
with 2 filters that can be controlled by spacing paramter..
new upcoming MFB Fricke in the same case as the lite II: looks like a synth lite II but is a Filter box with 24 dB/oct LPF filter controlled by a nice 8 step sequencer, it’s green. 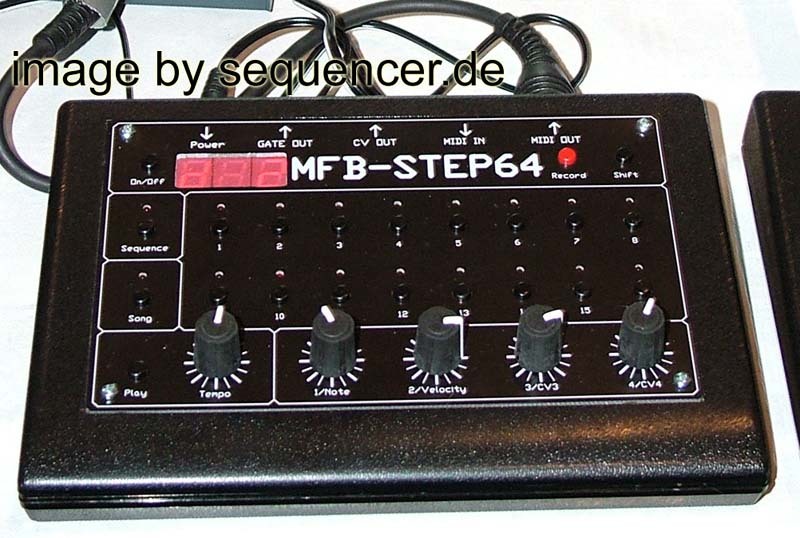 the bigger mfb multifilter with 2 envs and multimode filter.. of course with midi..also lfos in here..
the MFB Step64 sequencer works with CV and midi..
you can get a nice 4 voice polyphonic synth, it’s the same size and structure as the lite II and the same case.. but no knobs, it should be controlled by any CC box or computer or .. the lite II ’s midi out (controllers again).. it’s at 350€, so again very cheap for a 4 voice poly with 4 analogue filters..
PolyLite remote software for those who do not own a Controller Box or a sylite II that can also be used to control it..
hey, I fell off my chair when i set it to mono mode: I could play it and change the sounds INDEPENDENTLY ,so it it sort of multi timbral mono mode synth! 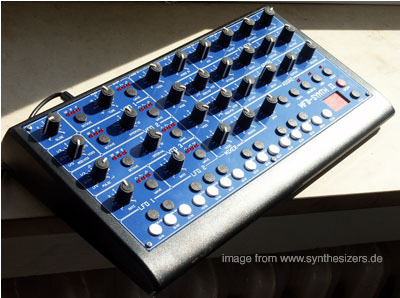 well, let me say: in poly this synth is even bigger, because you will now be able to play nice pads and chords.. since the env isn’t that fast it can be compared to the matrix line by oberheim, in fact it can producy nice pads! it doesn’t look like it, but it does very nice wide pads and basses..
-same casing and layout as the „old“ LITE but blue. -save your patches now! (83 RAM). 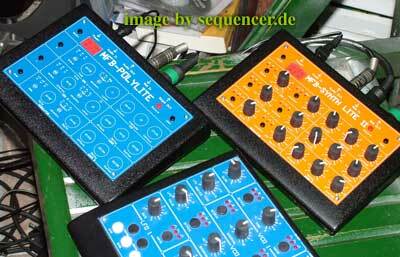 -Oscillators still digital (stable/stimmstabil) but with better and improved sawtooth sound. – detune/volume programmable -Lautstärke und Verstimmung programmierbar. -20 x Stepsequencer – 32 Steps (rec. via midi/über MIDI einspielbar). 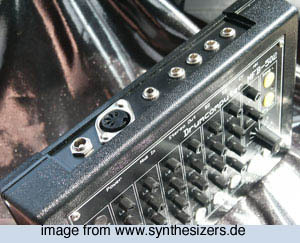 -Audio IN and OUT 6,3mm JAcks/Klinkenbuchsen. 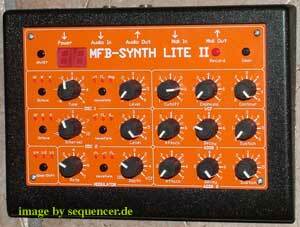 of course the lite series uses analog filters, the oscs are digtial. 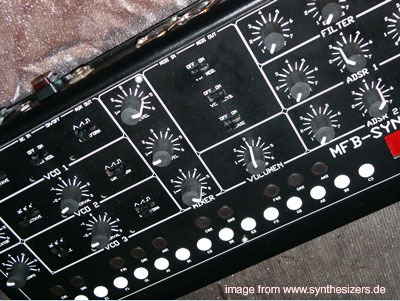 the LFO will of course mod the synched oscs pitch only if you set it to sync, it will operate as a small envelope (falling saw, one shot) if you wish..
the envs are ADSR but the Release=Decay or R=fixed since there are only 3 knobs for the envs..
the envs are ok, but not very fast..
here’s a nice orange one, there are 2 protos made, this is one of them..
this is my test-chair for the MFB family to check the polylite along with the lite II knobs.. a 5 voice synth or a 4 voice with lead voice synth on stereo is very nice with synthpop leads and pads.. SYNTH LITE 2 MFB SYNTHLITEII Proto – click on image to enlarge..
click image (above) to enlarge..
zum test gehts hier lang..
MFB Synth 2 test & audio demo!!.. 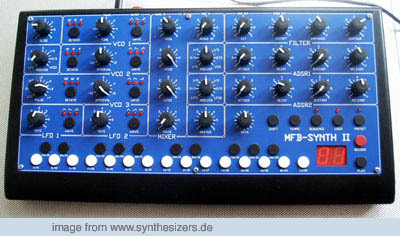 monophonic improved synth: MFB Synth2..
its sound is again improved, analogue filters!.. very good sounding, 2 lfos now much better accessible via the knobs (more knobs now). Die VCO Sektion besteht aus 3 VCO`s, die intern mit Volt/Oktave angesteuert werden. Als Wellenformen stehen Sägezahn, Rechteck (VCO2 Impuls und PWM) und Dreieck zur Verfügung. Mit dem Fußlagenschalter kann 4`, 8`und 16` bzw. 32’ gewählt werden, wobei sich VCO 2 und VCO 3 zusätzlich um +/- eine Oktave verstimmen lassen. 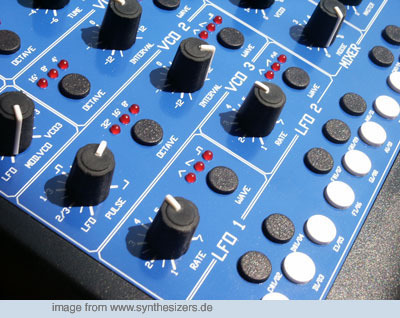 Die VCO’s können entweder mit einem LFO oder mit VCO3 moduliert werden. VCO1 kann auf Oszillator Sync geschaltet werden, VCO1+2 und VCO2+3 haben jeweils Ringmodulatoren. Im Mixer kann neben den VCO’s, Rauschen und ein externes Audiosignal dazugemischt werden. Das VCF besteht aus dem bekannten 24 dB Tiefpass Filter. Mit dem Emphasis Regler kann die Resonanz des Filters bis zur Selbstschwingung eingestellt werden. 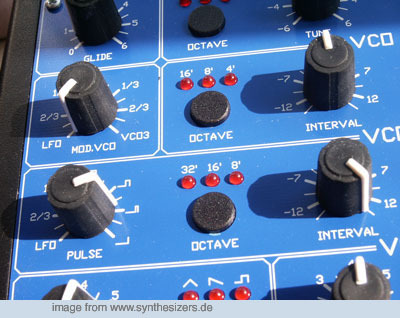 Das Filter kann mit einem LFO oder mit einem VCO moduliert werden. Mit dem Key Regler kann der Einfluß eines Keyboardes eingestellt werden. 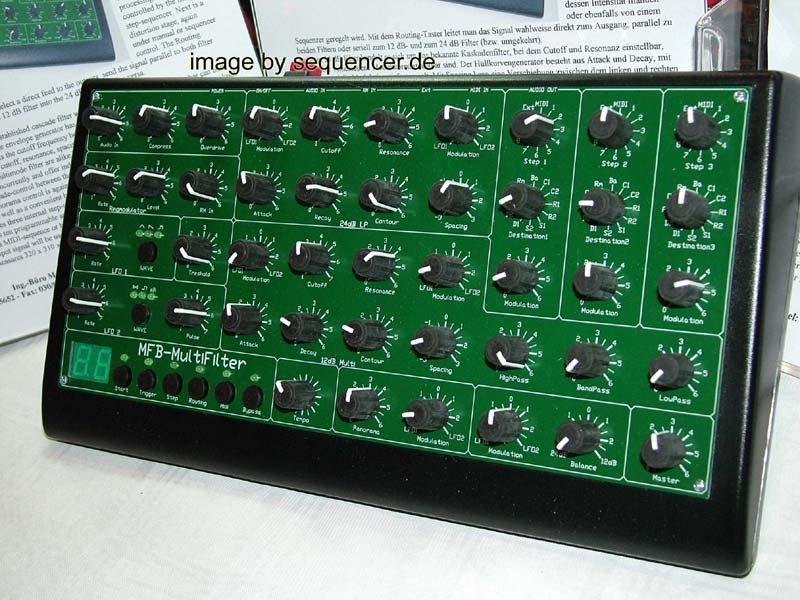 Für das VCF und das VCA gibt es jeweils einen Hüllkurvengenerator, mit Attack, Decay, Release und Sustain. 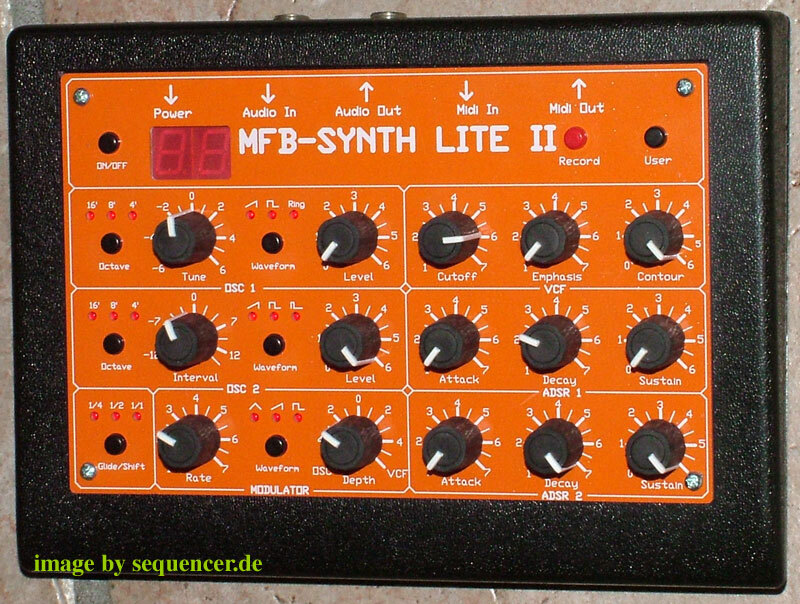 Das VCA kann mit einem LFO moduliert werden. Es gibt 2 LFO’s mit den Wellenformen Dreieck, Sägezahn, Rechteck und Zufall. Die LFO’s können auch als „One Shoot“ geschaltet werden, so daß man sie auch als Minihüllkurve verwenden kann. Neben 50 Presets, sind noch 49 User Speicher für die Parametereinstellungen vorhanden. 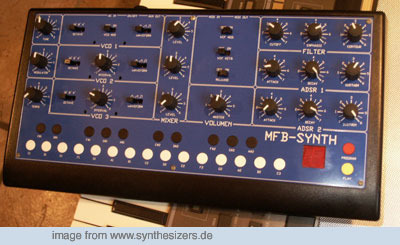 Über MIDI kann der MFB–Synth II auch dynamisch gespielt werden (VCF oder/und VCA). Ebenfalls wird der Pitch Bender und das Modulationsrad über MIDI unterstützt. MIDI Start, Stop und Clock können gesendet oder empfangen werden. 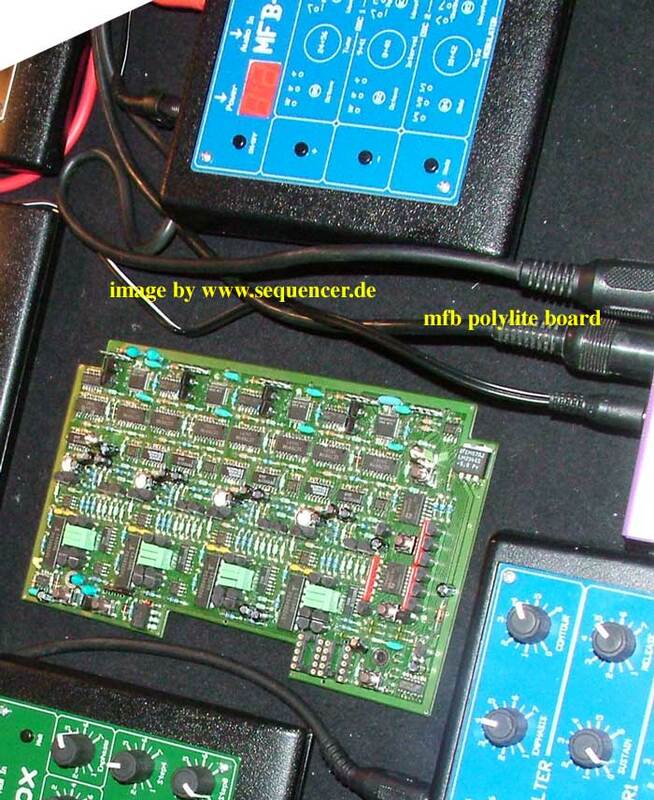 Als Buchsen gibt es MIDI In/Out, Audio In/Out und CV/GATE In. 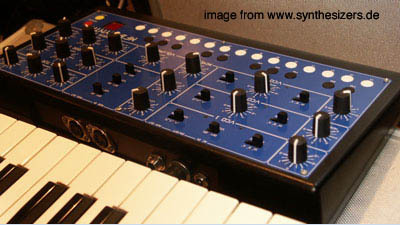 Der Synth 2 hat die Maße 315 x 165 x 38/72 mm. Zum Lieferumfang gehört das Steckernetzteil. 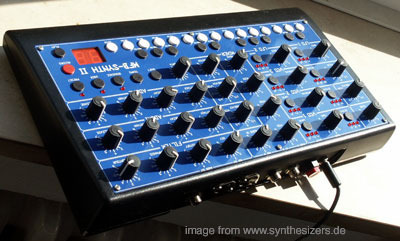 bei mir wars ein richtig edles schaltnetzteil..
another review by unease: go here..
this is a real TR-LED-sequencing Drumcomputer for 195Euro! 32steps max! (!!) you can have A or B or AB (B is called fill in here). can be played alternatively or chained to one big pattern. 72 RAM places to store your 32steps (or 2×16) and 8 songs. 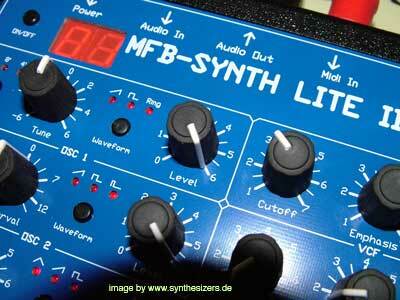 the MFB Synth Lite has the sound of a Moog Prodigy at 195Euro! Velocity on VCF and VCA, Midi incompared it to the alesis andromeda: if you do NOT use the suboscs, the mfb can reach the sound and fatness. of course you should not use all of andromedas complex mod routings then. 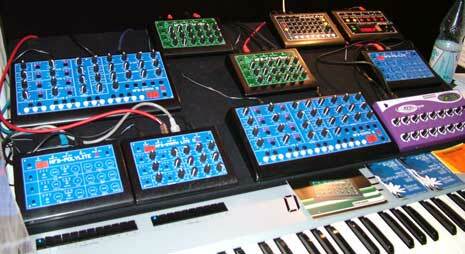 the envelopes are a snappier in the andromeda, especailly in „ultra percussive mode“. 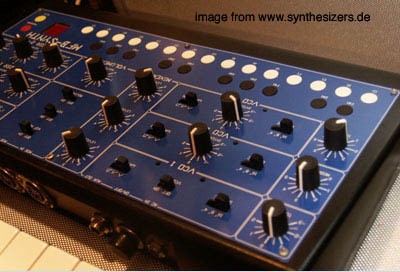 but the mfb has enough snappyness for „blip sounds“ and kraftwerk „zaps“, but not more – also it is very „moogish“ sounding! 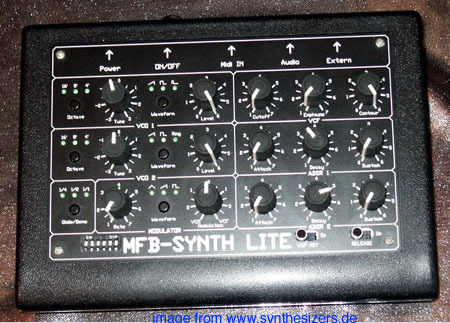 I do not see anything that speaks for buying old prodigies, these days.. ok, I do, the MFBs do not have as many hi harmonics..
btw: the lite series is all digital oscillators, but the filters are analog. 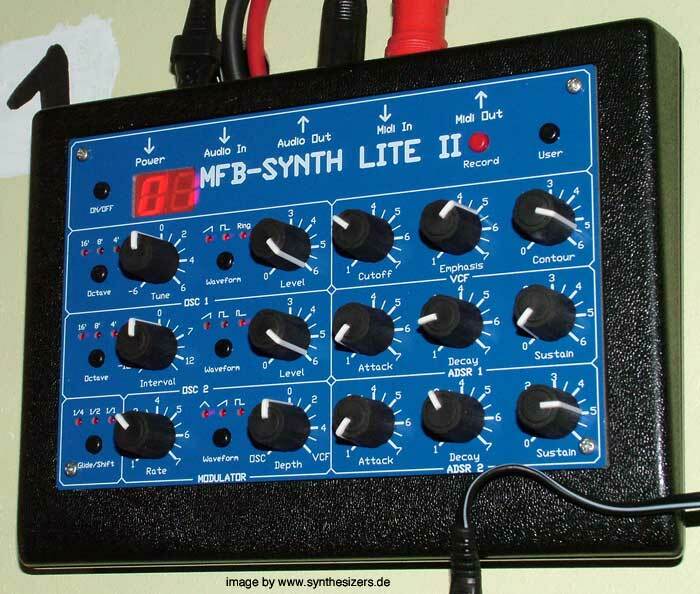 the Synth Lite has an audio in (small 3.5mm jacks), Midi in, a biiig power switch and a standard 9V DC in. Modwheel controls LFO amount on VCF or VCA (set via DIP switch). btw: its only as big as my hand! übrigens: die oszillatoren sind digital, dennoch hält sich die maschine klanglich in einem hohen feld auf.. dennoch hat ein minimoog sicher mehr obertöne direkt aus den oszillatoren kommen bei offenem filter, dennoch ist dies auch bei einigen analogen so und soll nur des vergleiches dienen.. bei DIESEM preis und diesem klang ist der fricke klasse.. ganz egal, auch wenn man weiss: die VCOs sind eigentlich digital.. es klingt!! there is a version for export ,that has ext. 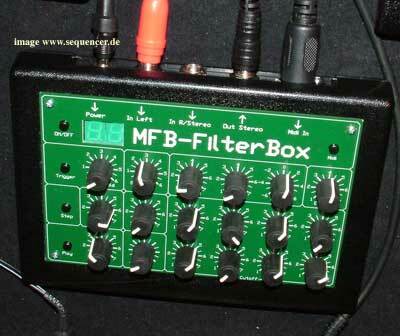 filter in and a noise generator..the german verison is CHEAPER!! 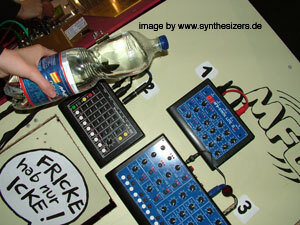 thats why fricke left out the input and noise generator that replaces the triangle waveform on VCO2. very live-able, bacause it’s only the size of 1.5-2 hands! rein technisch trennt ihn noch ein bisschen vom original,darauf geh ich also nicht extra ein..
-er ist aber billiger ,und der lite 195. 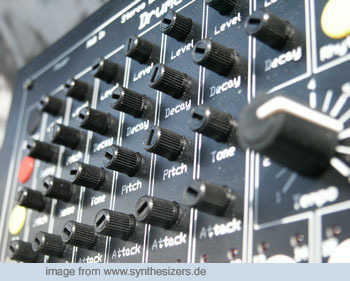 -und die envs sind nicht so schnell und haben auch nicht diesen „hold“ nach dem attack und „superschnelldecay“..
-dafür gibts einen extra lfo versteckt in der weichware und den kleinen sequencer. 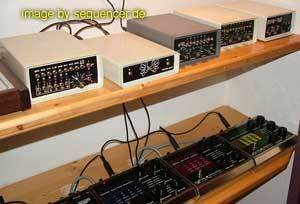 very close moog sounding filters (a bit more „industrial“) and 3 VCOs with 4-16′ oct.range. the tune knob ranges from 2-32′ (1 octave! up / down) so you can have 3 analogue vcos.this one is a „better prodigy“ or something.. it even competes an andromda, (well ok, if you do not use the suboscs.. or/and filter 1). 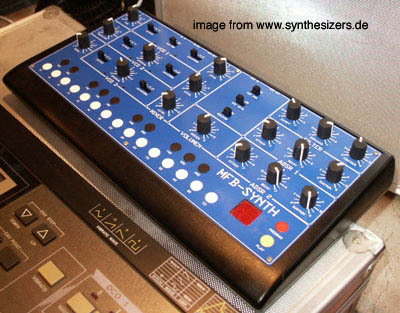 only the andro’s env’s are faster than the MFB synth’s..
this is the prototype mfb Synth 1! 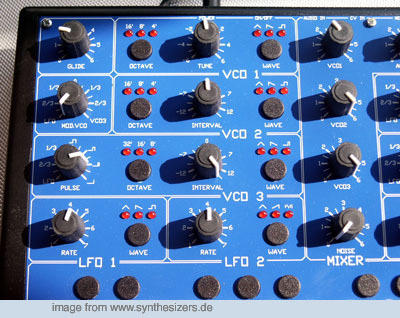 maybe the only blue synth I..
you can set the VCO3 to be an LFO by switching on VCO or VCF modulation. once this switch is set to on the LFO (vco3) reduces it’s frequency (still audible, if you keep the volume knob up on vco3) and mods filter cutoff or/and VCO pitch.you can also mod vca,vcf or vco (mod intensity by ENV on vca and vcf, to be precise) can be moded by velocity. 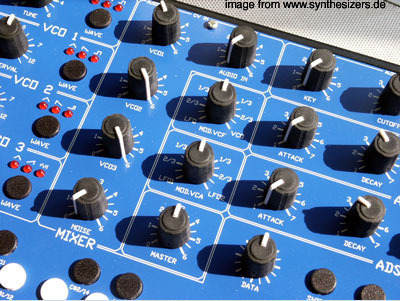 the wheel has another LFO that can be set to rectangular or triangle waveform. it’s speed is set in 7 steps using the keyboard!!.. also the mod target. 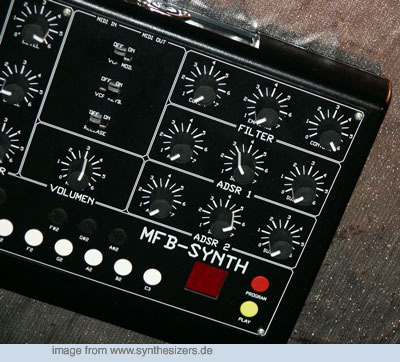 there is a newer MFB Synth .. the synth II, Poly and Lite II in the making.. maaaybe something will be shown in frankfurt at „Musikmesse“ (music fair) 2003 in march. (see above)the sequencer features 32 steps that can be just played on the keyboard (the display shows the step number) or you can set a pause by pressing play instead of a note on the 2 octave keyboard. „volumen“ is german vor volume ;) btw. 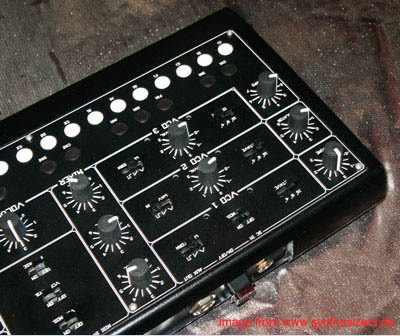 dieser „riesenzergo-moog“ ist wirklich fett.. und sehr kompakt zum mitnehmen auf livegigs!.. 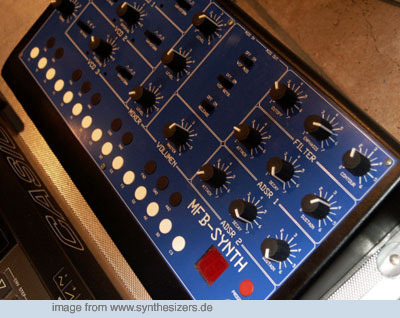 wer sucht da noch nach nem alten moog prodigy oder sowas..? aussdem sehr preisgünsitg!.. 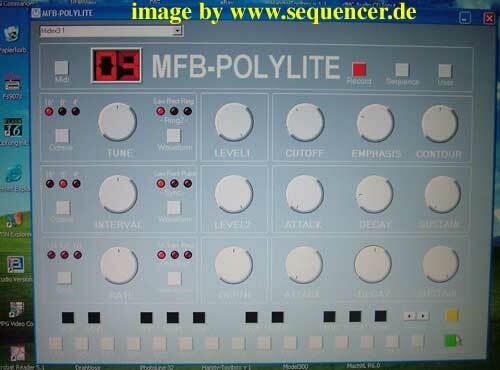 AUDIO from the older MFB Synth..
Drummaschine mit 7 Instrumenten und 32 bzw.64 Rhythmen. Drummaschine mit 10 Instrumenten und 128 Rhythmen. 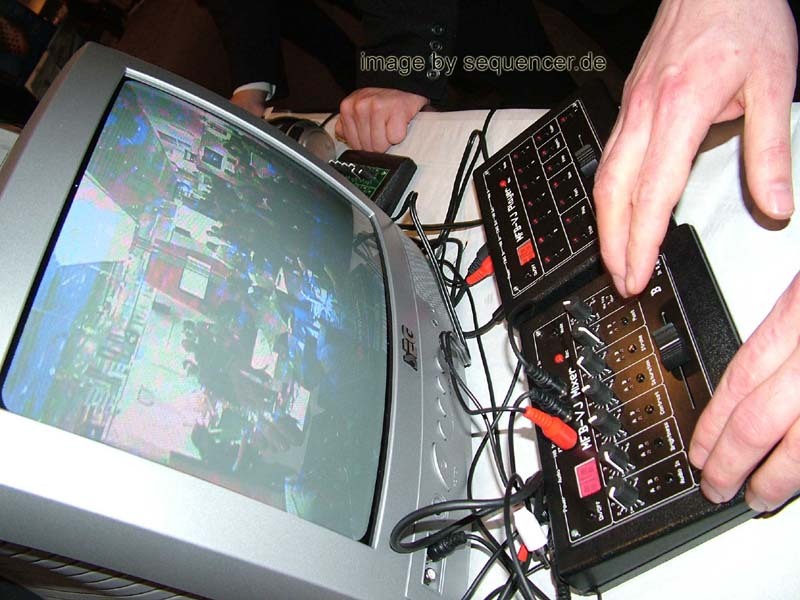 Programierbarer Drumcomputer mit 8 digitalen Sounds, 128 Rhythmen und 8 Ablaufsteuerungen. 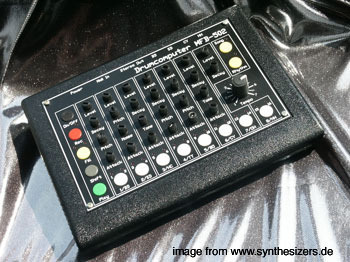 Digitaler Sequencer mit 8 x 64 Speicherplätzen. 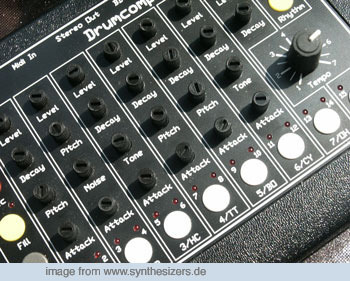 Programierbarer Drumcomputer mit 16 digitalen Sounds, 128 Rhythmen und 8 Ablaufsteuerungen. Mididrummer mit 40 digitalen Sounds, dynamisch, Einzelausgänge. wo gibts MFB fricke? 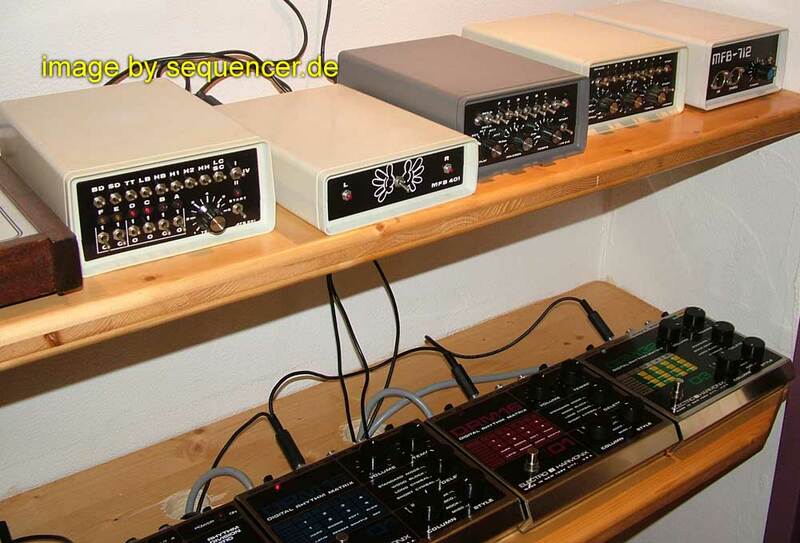 deutsche/ britische.. ANALOGE synthesizer / german distribution german/british and other synths.. vertrieb jomox, vermona, macbeth, mfb / fricke etc..
Hurra, Hurra – Die Küche die ist wieder da..